Generally a lot lighter than a top running system, under hung crane runways allow for more versatile usability. Underhung runways can be ceiling mounted because of being dramatically lighter. Also they have the ability to run side-by-side without interfering with one another. Another mechanical advantage that under hung crane systems have is that they can be interlocked together. By locking the adjacent ends of two cranes together an operator can transfer the load from one system to another. They can also interlock with monorails to allow for the transferring of material along a fixed path. 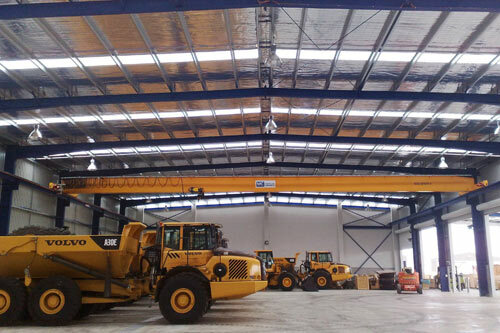 Usually suspended from roof trusses, these cranes are mainly used for maintenance purposes inside small areas, such as pumping stations and small workshops. They are compact in design and construction, making them ideal for low buildings that require maximum hook height. 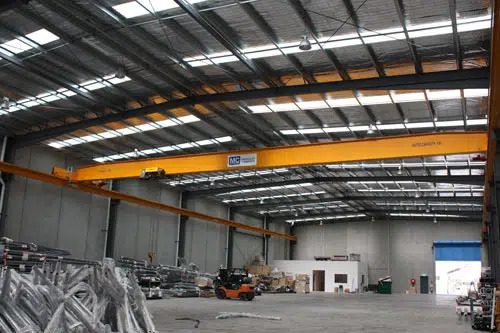 We are one of Australia’s leading overhead crane suppliers, offering modular component packages which cover an entire load range up to 250 tonne. Our range can be easily adapted to suit any factory shape or application. Generally a lot lighter than a top running system, under hung crane runways allows for more versatility usability. Underhung runways can be ceiling mounted because of being dramatically lighter. Also they have the ability to run side-by-side without interfering with one another. Another mechanical advantage that under hung crane systems have is that they can be interlocked together. By locking the adjacent ends of two cranes together an operator can transfer the load from one system to another. They can also interlock with monorails to allow for the transferring of material along a fixed path. Forklifts carry the risk of imprecise stacking, dropping goods as well as accidents (due to crashing). 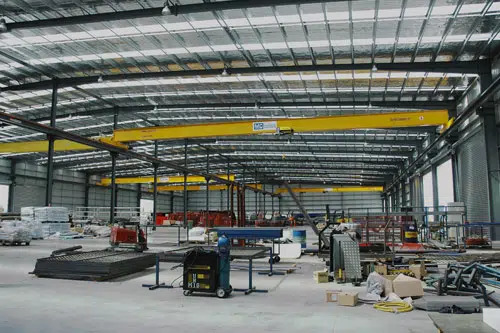 Since an overhead crane moves objects through the overhead space of the facility, they don’t carry any of these risks and are capable of moving heavy and bulky loads more quickly than forklifts and other lifting equipment’s. 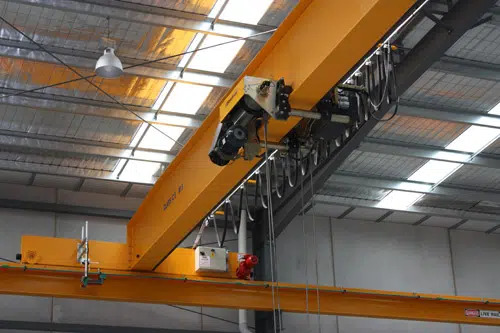 Overhead cranes, more often than not, come with precision controls that will position objects precisely and without much trouble. This allows the operator to place the load exactly where they want it to be, while minimizing human error. 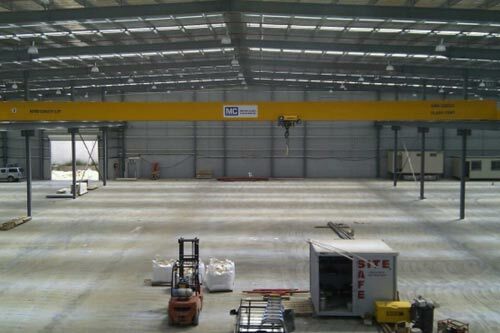 Since overhead cranes are positioned as high as your facility’s ceiling, they avoid just about everything on your warehouse floor. This, in turn, allows you to install the device just about anywhere you desire. Also, you will be able to carry items safely above any obstacles, thereby reducing product damage. 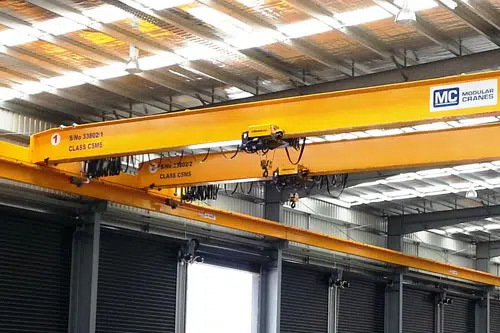 Overhead cranes do the heavy lifting for you, they remove strain on your operators, which reduces risk of injury, while reducing worker fatigue & accidents. 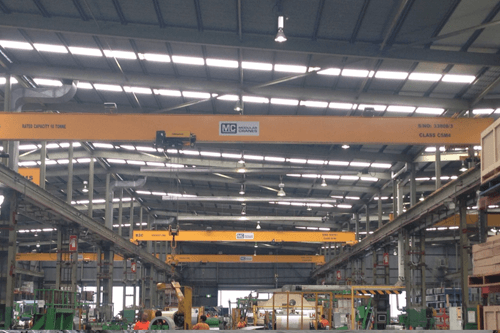 overhead cranes come with high lifting capabilities. What Type of Crane Do I Need? Modular Cranes are committed to providing a complete level of service for our customers. Contact us by calling 1300 663 8527 today for more information about our equipment and services. Modular Cranes is a family owned business. We have been delivering high quality products to manufacturers and warehouses for over 18 years. 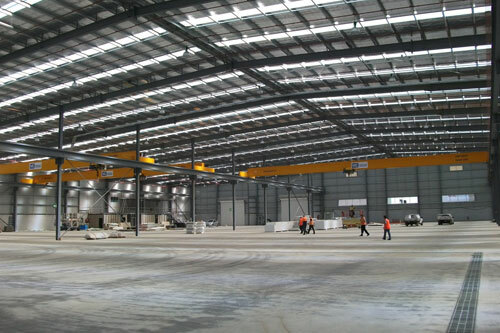 Modular Cranes has long been a superior crane supplier for Melbourne, Sydney, Adelaide and beyond customers. © 2018 Modular Cranes. All Rights Reserved.